Botulinum Toxin Certification Training Program for Physicians, Nurses, Dentists, and other Licensed Health Care Practitioners, hands on instruction and training with renowned “Physician Only” Trainers . Botulinum Toxin Classes on the administration of Botulinum Toxin for all common and not so common Aesthetic and Medical uses for the Aesthetic Practitioner. The Botulinum Toxin Training course is intended for Physicians, Nurses, Dentists, and other Licensed Healthcare Professionals who are eager to learn a specific skill set associated with mastering the injectable procedures. Our Botulinum Toxin Training workshops, and other aesthetic procedure training classes, are offered throughout the year at major destination venues just about every weekend. For your convenience, we have scheduled our most popular aesthetic training courses over a weekend so you can easily attend the complete set of programs. Empire Botulinum Toxin Training courses are considered to be the most comprehensive with hands on training as an integral part of the program and testing to ensure each attendee has satisfied the requirements for certification. For medical professionals interesting in developing or expanding their Aesthetics practice, Empire’s Complete Botulinum Toxin course is the best place to begin. These complete courses in Botulinum Toxin Training, Dermal Filler Training and Facial Aesthetics Workshops are the very basis for every Aesthetics’ practice. The Botulinum Toxin Training classes are very complete and encompasses all aspects needed to fully integrate this new procedure so that you can immediately begin performing these techniques on your own. The general format of the Botulinum Toxin workshop is to receive very detailed lectures in the morning followed by intensive hands on training in the afternoon with real patients. The workshop gives you the opportunity to use real Botulinum Toxin (Botox®) products on actual live volunteers, all medicines and supplies needed that would be used in the training are provided as part of your tuition price. Attendees are also welcome to bring along a friend or companion if you choose to use them for your Botulinum Toxin injection training. There is no charge to volunteers for receiving these free Botulinum Toxin injections. If you are unable to bring a volunteer to the course, Empire will provide you with real patients for the hands-on portion of the Botulinum Toxin Training class. In addition to the didactic and the hands on training, the Botulinum Toxin course covers other vital topics you’ll need to get started in Aesthetics. Subjects such as pricing and packaging, and marketing are covered in detail. In addition, and unlike other seminars, Empire is proud to partner with hundreds of qualified Vendors and Exhibitors we are invited to all our programs in order to share with our attendees the latest and greatest when it comes to Aesthetics and new technologies. Many of these Vendors are selective as the events they partake in but are eager to be part of all Empire events because of our established 20+ year history in the industry and our reputation. Their presentations are naturally separate from the CME area of training. Physicians, nurse practitioners, dentists and other licensed healthcare professionals will receive and will learn all the protocols associated with each of the Botulinum Toxin Type A products such as Botulinum Toxin Cosmetic as well as the newer, highly effective Xeomin and Dysport, all are FDA approved products. To operate a successful aesthetic practice it is important to know about and be able to utilize the different products your patients may ask for. Each of the FDA approved products will be available and used during the hands on portion of the class so you can decide on your own which Botulinum product will best suit your practice objectives. Empire Medical Training’s Botulinum Toxin course has been awarded the highest level of accreditation, AMA PRA Category 1 CME . In addition, Empire is proud to work with a dedicated group of expert, physician only instructors, one of the reasons we are different. Our faculty has expanded to include some of the most renowned "celebrity" physicians in the nation. 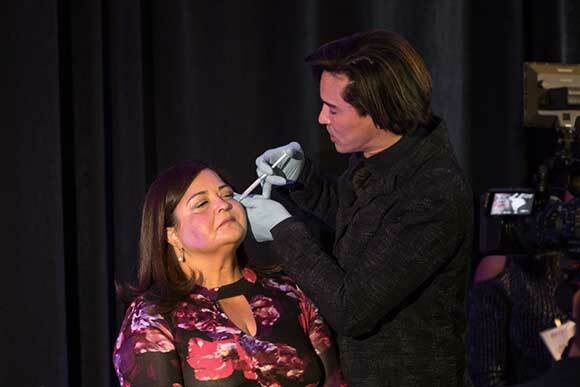 Empire Medical Training has remained a milestone in the Aesthetics community over the past two decades, transforming and improving our curriculum from our first Botulinum Toxin workshop to our curriculum now , providing over 30 topics in Aesthetics and Medicine throughout the Nation. Comprehensive Training and Certification: This is a certification program intended only for Physicians and other licensed health care professionals and practitioners. Only qualified professionals will be accepted into the program and/or receive a certification in Botulinum Toxin administration. After completion of the course and demonstration of proficiency, you will receive your certification and course certificate. 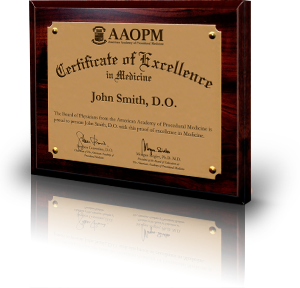 Attendees also have the option to receive their certificate framed in an attractive wood and metal plaque. We provide physicians, nurse practitioners, dentists and other licensed healthcare professionals with everything needed to perform Botulinum Toxin injections safely and correctly in a practice setting. You will not only become certified to perform Botulinum Toxin injections, but also gain a level of confidence working on your own patients. Practical Training: The training you receive covers more than just theory, our instructors teach you the "pearls" of performing Botulinum Toxin injections as well as on the entire process and everything related to the overall procedure including protocols for orofacial pain and other medical conditions. During the program you will learn how to perform the most popular cosmetic procedures utilizing Botulinum Toxin as well as how to reconstitute Botulinum Toxin, where to buy your product, how to price the Botulinum Toxin procedure, learn our unique strategies that will have your patients committed to only having you perform their Botulinum Toxin injections including many other proprietary and unique advanced techniques created and taught by us. Lecture and Course Presentations: Attendees receive a complete set of training materials which are intended to be used later on as a reference tool in your office. The materials include a comprehensive Botulinum Toxin training manual, written editable protocols, 2 aesthetic manuals, consent and treatment forms, instructional videos on each procedure (DVD and through VIP members only login), and a supply of marketing materials through our physician portal. The didactic presentations are extensive and up to date with the newest protocols and information available. Our staff and team of instructors are constantly updating our material. Course Instructors: Our faculty of physician instructors have been teaching Botulinum Toxin techniques exclusively for us for many years and have extensive experience and knowledge in Aesthetics. We have received thousands of written and video testimonials regarding our instructors and they contractually may only teach for us. Our team has developed many unique and proprietary techniques and methods to help you successfully integrate these new Botulinum Toxin and Dermal Fillers into your practice. They are eager to share this knowledge with you. Ongoing Support and Consultation: In addition to our top notch staff, we provide ongoing support and consultation not typically provided in medical education. For one, we provide a library of instructional videos to help you refer to these Botulinum Toxin injection techniques later on. These are free videos and are intended to help our attendees master the procedure after the program. In fact, you may even begin learning about some of these techniques today because many are available on our website. You will have access to our complete library once you attend a program. While you are reviewing the instructional videos, have a look at what your colleagues have to say about our workshops. There are over 100 videos published on You Tube and our website today. Space is limited and these Botulinum Toxin Training classes fill to capacity quickly so please make sure you call ahead to reserve your slot. You might think Botulinum Toxin Training is only for cosmetic surgeons, dermatologists and other professionals that deal with cosmetic treatments. However, this assessment would be inaccurate, as any medical professional is able to complete training and become certified in providing Botulinum Toxin services. For instance, some medical doctors are looking for ways to increase their potential revenues for their practices. Offering Botulinum Toxin cosmetic services provides a viable solution. Instead of having to refer patients seeking these services elsewhere, they are able to supply solutions in their own offices. In addition to Botulinum Toxin (Botox®), many medical professionals decide to complete other related aesthetic training courses, such as cosmetic laser treatments, sclerotherapy training, and other facial aesthetics courses, to offer a wider variety of services those attracting a greater patient population to these services. Botulinum Toxin training is just one course you will find that we offer in aesthetics. In addition to Botulinum Toxin, there are also a variety of aesthetic and cosmetic courses, including dermal fillers and advanced Botulinum Toxin applications. Each of our courses is designed to provide you with in-depth knowledge about the particular area of study. Our instructors teach you about the latest Botulinum Toxin technologies being utilized in the field, as well as give you hands-on training on real test subjects to help polish and refine your skills. Further, each course contains a business section to teach you how to market and advertise your newly acquired skills in addition to a physician portal of supplemental information in each course study, to help grow your business. Finally, each course has its own set of course objectives including what information will be needed to pass Botulinum Toxin certification exams. Our Physician instructor will travel to your location and spend 1 day with you teaching and performing additional Botulinum Toxin techniques for your patients. This is a custom program and can be personalized and structured to your specific needs or desires for training. Empire has trained thousands of physicians and dentists this way and has become extremely popular because of its effectiveness, savings in tuition, and potential to earn more revenue during that day performing techniques on patients with our instructor without the cost of travel or closing of your practice. The typical tuition is less then what you think and includes all travel and related costs. Training can usually be arranged as early as within 7-10 days; however, additional notification is certainly appreciated. For more information or to schedule your training. Call us today at 866-366-1576. Botulinum Toxin medications have been FDA approved for cosmetic and therapeutic purposes since 2001. Botulinum Toxin injections remain the #1 non-surgical aesthetic procedure performed in the United States with over 11 million injections annually. Botulinum Toxin aesthetically is most commonly used for dynamic rhytids (wrinkles in motion) as it inhibits the release of ACH at the neuromuscular junction needed for muscle contraction and is used in interventional pain management due to its secondary effect of blocking and inhibiting the release of glutamate which acts as the brains main excitatory neurotransmitter (CGRP). History of Botulinum Toxin. 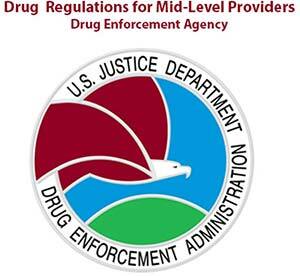 Overview, current applications and newest advancements, federal and state regulations, FDA Approved Applications. Patient Consultation Process. Communicating expected results of Botulinum Toxin Treatments. Learn which techniques that will satisfy your patient's goals and concerns and properly mark facial zones. Proper storage, reconstitution, and administrative concerns, record keeping, and patient charting. Hyperhidrosis (excessive sweating), Bruxism, and Chronic Migraine Headache protocols and overview. Learn proper dosing and diagnose various orofacial pain disorders and the use of Botulinum Toxin. Hands-On Sessions. Small group breakout sessions with live volunteer patients. 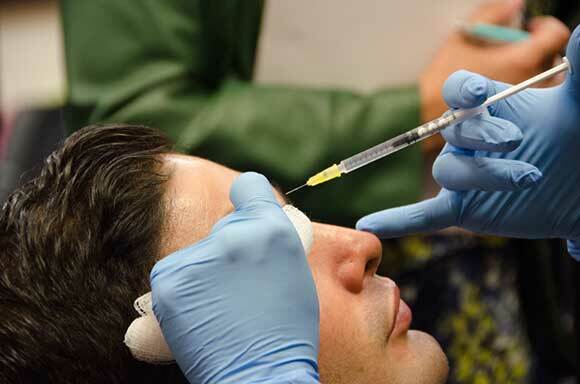 Attendees will be required to administer Botulinum Toxin and show proficiency in review of treatment and injection technique and administration. How do I become Certified to perform Botulinum Toxin Injections? You need to enroll in and successfully complete training in an accredited, AMA approved Botulinum Toxin Certification Course (be careful, most are not!). Empire Medical Training has certified more physicians and nurses in Botulinum Toxin administration than any other organization in the US or abroad ! 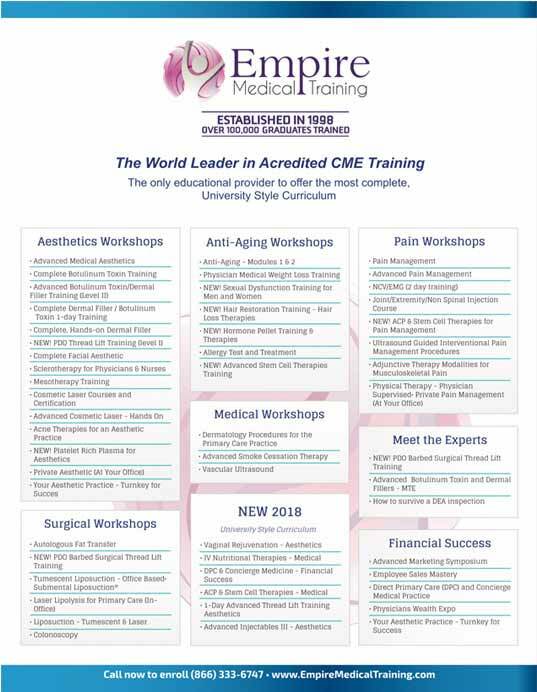 In the past 20+ years, Empire has graduated over 100,000 health care professionals and has been awarded the highest level of CME accreditation for its Botulinum Toxin Certification Courses, the AMA PRA Category 1 CME™. The certification process begins with a full morning of intensive didactic presentations, including protocols, guidelines, manufacturer recommendations, and Pearls from Empire’s outstanding “Celebrity” Physician instructors. After the afternoon Hands ON training on live patients, applicants will be expected to demonstrate proficiency in a variety of Botulinum Toxin techniques followed by knowledge testing. At the conclusion of the program, attendees who have completed all aspects of the training and passed the proficiency exam will be awarded their Botulinum Toxin Certification.